Aye, as if the US needed any more reasons to be hated, loathed, despised, it wastes food and then gloats over its propensity to eat trough its shirt front and lap: "When I'm cut open at my autopsy, my arteries are gonna look like undigested Tco Bell burritos bwahaha (sic) your just jelaous haha". A little bit of 9/11 can be found in virtually every fast food restaurants trash can. If you are fat, you aren't poor. If you think the rich should be taxed more and you are being taxed too much, you aren't poor, you are a thief. Poor is relative and it is often the poor who are fatter because healthy food costs more money. It is the bad-for-you stuff that is cheaper. There are a variety of reasons, but that's pretty common. Often being fat is not a sign of the ability to purchase as abundance of food as it is a sign of not being able to afford to purchase healthy food. Sure for the past year we have been having a drought and this may reduce the amount of food available. But people are starving because of the high cost of food and the lack of money to buy food and not because of lack of food. 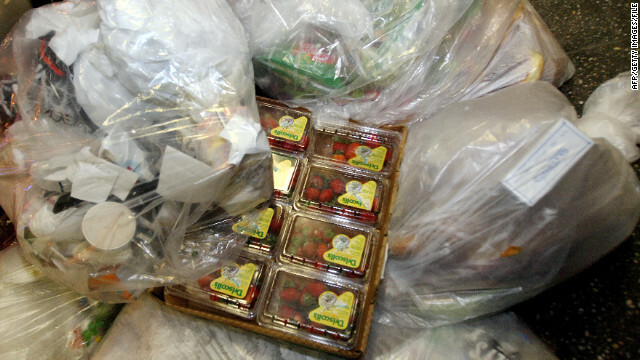 There are also a lot of laws and business policies that make donating this wasted food very difficult. I've worked in several restaurants and asked several times why we threw out certain items and was told every time that donating it either wasn't allowed (legally) or wasn't as beneficial (got a bigger tax break writing it off as waste than by donating it, but the law said to be written off as waste it had to actually be wasted–e.g., thrown out and not donated). So yeah, a lot of people are starving because they can't afford food, but a lot of food that is perfectly good and could be going to food banks and homeless shelters isn't because of legal and corporate policies and red tape. The United States accounts for over half the global export market for corn and nearly half of the soybean market. Some corn ends up in products like cereal and soda, but the biggest chunk is used as feedstock for pork, chicken and beef. Unlike in 2007, when a worldwide drought sparked serious food shortages, this year has seen strong crops of rice and wheat. Plus, worldwide stockpiles of corn, soybeans and other crops are healthy. Ive worked in commercial kitchens my whole life. The amount of waste is staggering. There are times I want to cry seeing what gets wasted and how much. Most people are so clueless as to how much catering and eateries waste. My kitchen alone could probably feed a couple dozen families DAILY with what is wasted. I am sure larger kitchens waste even MORE. The left overs in a larger restaurant is usually reused or fed to the people that work in the kitchen/restaurant. What comes back from the tables on the plates is usually enough to feed a couple of dogs with. Bush was just a sock puppet for the corporatist facists. And yes, they destroyed America. Retailers want the food to go bad on the customer and not on them. That way the customer thinks they got their money's worth at the time of purchase say on a family pack of strawberries but have to throw out the moldy half of it the next day. The retailer gets the money from the sale of would-be wasted food instead of having to throw it out and take a loss. So if the portion is too big, don't buy it. Hey retailer, if I wanted that much I would buy 2 smaller portions. So I won't buy any at all and off I go to the bulk section of the store. Retailers do not want your food to go bad. Most packaged foods are designed to feed a family of four, the American standard. Thuyen and I have been working for the industry for over 20 years. We are more than sure that we waste more than 40%. Can't give it away, If people get sick they will sue the stores. Several years ago we took a friend visiting from a somewhat poorer country to a buffet style restaurant. I asked him what he thought of the abundance in this country, not just food, but everything else, including the many disposables items we use and throw away without much of a thought – paper napkins, containers, plastic utensils. He said: "I think the United States laughs at the rest of the world". I've never forgotten it, and this brings it back to mind. Americans have no idea what it is like to value food like most people in other countries, who pay much more for it (when they can), do. I suspect we'll start learning that soon. All news stories these days are deliberately deceitful. The purpose is to enrage and confuse you. I have zero respect for the malicious gossips that masquerade as journalist these days. Haven't any of you guys gone dumpster diving at Dunken – Donuts in the middle of the night??? You haven't lived until you put that under your belt for the memories!!! Bush had nothing to do with the nation's wasteful tendencies or the marketing within grocery stores that "full shelves sell" - a strategy that has been used in the grocery industry since the 1950s. A batch of fresh chicken looks more appetizing to people in store. If the supply is scant, invariably, the next question someone asks is, "Is that fresh?" No one buys the last of anything either. They just don't. Americans are incredibly picky consumers with tons of "food hang ups" and we pay for their wastefulness. The food needs donated but the health regulations again deter much of that food from being distributed. The only vendors who never overstock their shelves are commercial bread vendors because they have to pay out of pocket for their "stale" when it is returned. They only get paid for a loaf when it goes through the register and the margin is small. Most other vendors fresh or stable overproduce to catch the eye of the consumer but adequate measures are not in place to distribute what is not sold. Management and employees alike would love to give that food away to local people in need. Years ago, there were no such regulations. I worked at a bakery when I was 18 years old and each night the local Catholic Church that ran a mission house would come and take our day old that could not be sold the next day. We counted everything up and gave the donation slip to the office manager. It was that easy to help out the local community. It should the same again. None of this would be wasted and the finicky shopper could still have their over filled display of foods to choose from, and more. To change this you would have to completely re-engineer grocery marketing strategies, change the way consumers think, and have a fail safe plan for shopping spikes when those displays can easily be wiped out in minutes, which is, inclement weather, football parties, and holidays etc. Easier donation regulations is key to eliminating the waste.